Redefine your look with a natural, beautiful Facelift Dr J.
Dr. Jacobsen and his staff feel it is very much a privilege to take care of a woman and make her body beautiful for her. We know that cosmetic surgery done well means a great deal to women and their families. Experience Dr J's expertise and book a consultation today! Dr. Jacobsen recognizes there are many options when it comes to receiving a facelift in Phoenix. One’s face is possibly the most personal and precious part of their body, and as such the facelift is a delicate procedure to be allowing a facial plastic surgeon in Phoenix to perform. Dr. Jacobsen feels very privileged and honored for every patient that lets him care for their facelift and sculpt the face that they have always wanted. Although the title of best cosmetic surgeon in Phoenix is subjective, Dr. Jacobsen can assure you that you will have one of the best experiences in Phoenix facial plastic surgery. When it comes to Phoenix facelift doctors, Dr. Jacobsen strives to provide top-tier service before, during and after the procedure. Some surgeons claim in their advertising that they teach other surgeons how to perform facelifts or other cosmetic surgery in Phoenix to elevate their advertised facelift skills as a marketing technique. Dr. Jacobsen instead uses that time to further his own techniques, instead of teaching something that can always be improved on. Dr. Jacobsen will personally assure you that you will have an excellent and safe surgical procedure for your facelift followed by care by his staff, and fastidious follow-up 7 days a week. Dr. Jacobsen will be there for you, and will answer your calls, emails and your text messages after your surgery. When it comes to Phoenix facial plastic surgery, Dr. Jacobsen knows that with his excellent surgical skills and wonderful postoperative service you will not only get the facelift you’ve always wanted, but also the best facelift Phoenix experience. Facelift surgery must be done very carefully. The surgery requires delicate surgical skills and careful attention to detail. Each patient wishes to have certain parts of the face tightened to give a more youthful look or healthier look and a more awake and alert look. Generally, the incisions are in front of the ear hidden in a vertical fold in this position and then following the back of the ear, and then down the scalp at the hairline, and behind the ear as well. These incisions are often easily hidden into the normal lines of the face. Through these incisions, the face can be lifted. Lifting the neck and creating a better contour to the neck and the angle under the chin tightening this area as well as the lower and middle portion of the face. Skin is removed that allows the face and neck to be tightened. Often an incision is required under the chin to assist in tightening the neck, creating a more favorable angle under the chin. Most patients wish to have a natural look, and do not wish to be pulled tight too much. Leaving a freshened and healthier appearance without looking like they have had a facelift or recent operation. Dr. Jacobsen does his best to give you a natural look without pulling it too much. The number 1 question patients ask is what is their downtime? The downtime is particularly different depending on what your daily life is like. If you have a conference or have to give a talk to a large room with people you probably will need to have 3 weeks of recovery to allow the swelling to go to an adequately to feel comfortable speaking in front of people. However, if you are working at a desk and are comfortable you likely can return to work in a week. There often is swelling that needs to be cared for, and only time will bring this down. Most the swelling is largely gone after the 1st week and then continues to go down over the next 2 weeks. Because the facelift really is not noticeably painful, people tend to do more after the surgery than they should. Dr. Jacobsen and his staff warn patients to minimize physical activity and to avoid lifting and straining and bending over or loading the dishwasher or opening heavy doors or carrying heavy bags. This causes swelling to persist. If you do too much you will have persistent swelling. 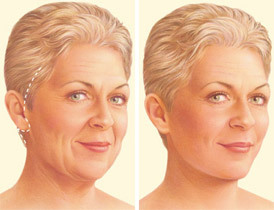 Often the facelift and the neck lift combined into one operation. The facelift when it is done by tightening the lower face a portion of the upper neck must be tightened as well to have a tapered appearance from the face to the neck. Similarly, if the neck is the main focus of the tightening, then a portion of the lower face must be tightened as well so that the neck tapers nicely into the face. The face cannot be tightened entirely by itself without the neck. The neck cannot be tightened entirely by itself without the face being tightened as well so that there is a nice taper from one anatomic area to another. Dr. Jacobsen uses a compressive elastic garment that extends from the top of the head with a Velcro under the chin and the face to apply gentle pressure to give a nice contour to the neck and to prevent bruising and bleeding after the operation. This usually is used only for 3 or 4 days after the surgery. Women usually asked about using ice on their face. I do not recommend using ice on the facial skin after the surgery as this can cause some injury to the skin. Facelift operations are very well tolerated by women. It is nearly painless. It is one of the most painless operations and cosmetic surgery. It would seem as though the operation would be quite painful, because of the incision and the sensitivity around the face and neck. However, most women feel very little pain but more of a sensation of tightness. It is very important after the operation to avoid lifting or straining. The incisions are finally closed with very fine suture material. Usually Dr. Jacobsen uses 7-0 Vicryl absorbable suture material. The suture material is dissolvable and usually falls out on its own after about 2 weeks. The incisions are sealed with a fine layer of DermaBond a cyanoacrylate that is most like superglue but is flexible and is sterile. This seals the incision and prevents bleeding and allows you to shower after the surgery immediately. The incisions after the surgery required no creams or ointments or any specific care other than keeping them clean and dry with antibacterial soap and water. You may shower directly after the incision as well. It is best to treat the facial incisions after surgery with ice taking care not to freeze the skin with direct icing but using indirect icing with frozen peas in thin Ziploc bags or masks that can be obtained at the pharmacy that are filled with gel that can be frozen and interchange throughout the first day or 2 after surgery. After the first 24 or 48 hours ice or cold packs will no longer help alleviate swelling. In the first day this can be very comforting and prevent additional bruising and minimize the swelling. The best way to minimize the swelling however is to avoid lifting and straining after the operation. Even minor bending over to load the dishwasher can often allow your face to fill up with blood and feel congested and cause you to bruise or bleed. It is best not to bend over or to lift and to allow your family to help you with car doors and heavy doors wherever you are. He should sleep with her head of bed elevated at least 30° with an extra pillow which helps a great deal as well. Your blood pressure should be maintained in a normal range as well. Bruising always goes away with time and is always disappointing when patient skin bruising around your face and neck. It always goes away with time, but it is best to avoid this is much as possible with your own postoperative care. In a leading city of plastic surgery, techniques used in Phoenix facial plastic surgery are regarded as some of the best. If you’re considering a facelift Phoenix experience, please feel free to contact Dr. Jacobsen’s office with any questions or to schedule an appointment! Dr. Jacobson rarely uses drains. Normally for a full facelift the patient stays overnight in the surgery center recovery care center so that we can control your blood pressure and any pain issues that you may have as well as insure that you are well hydrated and without any nausea so that you can recover smoothly. Often, patients feel perfect throughout the day after the surgery and wonder whether why they stayed overnight. Usually patients feel great because the nursing staff there under Dr. Jacobsen’s direction and take great care to make sure that you are as comfortable as possible. Dr. Jacobsen prescribes a facial garment that is compressive that is worn under the chin and over the cheeks for the first few days to minimize any bleeding and to minimize any swelling. This is a comfortable elastic device that can be taken on and off after the surgery. 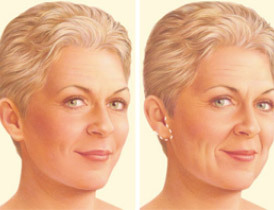 Patients often wish to have only their neck or only their face done without the other. It should be kept in mind however whenever the neck is lifted that the lower part of the face has to be lifted a little bit with it otherwise there is a transition zone between the neck and the face that causes folds, so a neck lift has to be tapered up onto the face. Inversely, if the face is done, the lower face has to be tapered by lifting a portion of the upper neck as well otherwise there is another transition zone between the face and the neck that causes folds so a facelift has to be tapered down onto the upper portion of the neck. Commonly the chin is somewhat saggy. Chin is sag can create the loss of the sharp angle and definition of the underside of the chin with the neck. During the facelift this area is rejuvenated by making a small incision under the chin directly in the fold under the chin that all adults have. In this way this incision is hidden. This incision can be used to remove some of the fat under the chin and to tighten the muscles under the chin as well. This gives a much sharper angle to the chin and to the neck. As a result, there are often incisions in front of the ear behind the ear and under the chin as well. It should be noted that for men many times a facelift is a bit more complicated. Because of the bearded skin there is more likelihood of bleeding and bruising postoperatively. The blood supply to the bearded hair bearing skin of the face and neck in men is much more profound and thicker. This can be managed and a facelift in a man is safe however it requires very careful surgery and very careful postoperative care. This can change the border of the hair bearing skin as it pulls the hair bearing skin laterally towards the ear slightly and up towards posterior neck as well. Sometimes male patients will have to shave just a little bit differently to accommodate the facelift. All the sutures are used by Dr. Jacobsen are dissolvable. Drains are rarely used. All the incisions have surgical sterile glue placed on the incisions, so you may take a shower the same day after surgery. Facelift surgery must be done under a light general anesthesia and SurgiCenter. He will need to have a physical by your family doctor electrocardiogram and blood work done ahead of time. Patients are often concerned that they may need another facelift in the future. This is possible. The likelihood of needing an additional facelift in the future is dependent on many factors including the nature of your skin, your activity, smoking, and other risk factors. You do not have to wait until you are very old and look very old before you can have a facelift. Younger patients are now having facelifts in their 40s. Even having a small mini facelift to help freshen their face with minimal scarring. The mini facelift has a very short downtime. As a restorative surgery, a facelift does not change your fundamental appearance and cannot stop the aging process. A facelift can only be performed surgically; non-surgical rejuvenation treatments cannot achieve the same results, but may help delay the time at which a facelift becomes appropriate and complement the results of surgery. Phoenix facelift doctors are some of the most renowned in the world. If you considering a facelift in Phoenix or are interested in learning more, please feel free to contact our office to learn more. A traditional facelift incision often begins in the hairline at the temples, continues around the ear and ends in the lower scalp. Fat may be sculpted or redistributed from the face, jowls and neck, and underlying tissue is repositioned, commonly the deeper layers of the face and the muscles are also lifted. Skin is redraped over the uplifted contours and excess skin is trimmed away. Note: This is a pre-examination estimate that is appropriate for most patients wishing this service. The fees may change slightly based on your personal needs.